Consultant Pediatric surgeon, Sultan Qaboos University, Muscat, Sultanate of Oman. Address correspondence and reprints request to: Zainab Al-Balushi, Consultant Pediatric surgeon, Sultan Qaboos University, Muscat, Sultanate of Oman. Al-Balushi Z, Ehsan MT, Al Sajee D, Al Riyami M. Scapular Bronchogenic Cyst: A Case Report and Literature Review. Oman Med J 2012 Mar; 27(2):161-163. Bronchogenic cysts originate from abnormal budding of the tracheal diverticula during the embryological period. Inaccuracy in the process of growing of the ventral foregut will give rise to bronchogenic cyst. Scapular bronchogenic cyst is an extremely rare form of this anomaly. A three years old boy suffered for 2 years with left sided suprascapular cystic lesion which was gradually increasing in size. The swelling was 4 × 3 cm in size and non tender. The cyst was evaluated by CT scan that showed complex cystic lesion over the left scapular spine. Total excision of the cyst was done and histopathology showed cutaneous bronchogenic cyst. The proposed mechanism for such cutaneous lesion is that the accessory buds from the tracheobronchial tree/primitive foregut migrated from the thorax in an aberrant manner to lie in periscapular positions. The definitive treatment of scapular lesions is total surgical excision. The final diagnosis is based on the histopathological findings in the majority of cases. Keywords: Congenital; Scapular; Bronchogenic; Cutaneous. Bronchogenic cysts originate from abnormal budding of the tracheal diverticula during the embryological period.1 During the third week of embryonic development, the dorsal portion of the primitive foregut lengthens to form the oesophagus, and the ventral portion of the primitive gut undergoes differentiation to form the tracheobronchial tree. Insuffiency in the process of growing of the ventral foregut will give rise to bronchogenic cysts.2,3 The eventual location of the bronchogenic cysts depends on the stage of development in which the errors occur.2,4 Mediastinum is the most common extrapulmonary location. Other rare location like lingual, intra-abdominal and cutaneous regions have also been reported.1 Cutaneous bronchogenic cysts are the most infrequent lesions that are diagnosed by histopathological examination. However, the scapular bronchogenic cyst is an extremely rare form of this anomaly.5,6 Hereby, we describe a boy with a scapular bronchogenic cyst where the diagnosis was made by histopathological examination. Figure 1: Scapular bronchogenic cyst. 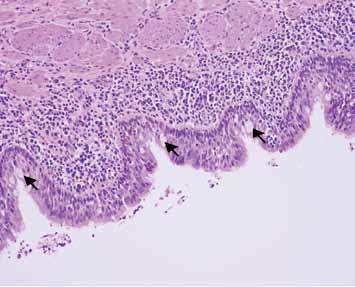 Figure 2: The cyst is lined by ciliated pseudocolumnar respiratory type epithelium (left) and squamous epithelium (right). Sermucinous glands are present in its wall (H&E). 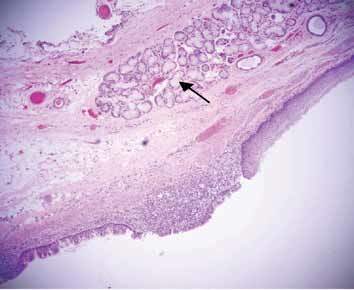 Figure 3: High power view of the ciliated respiratory epithelium with interspersed goblet cells (arrow) and smooth muscle bundles in it (H&E). This very rare congenital anomaly may present as common superficial skin lesion. Therefore, pediatric surgeons should be aware while dealing with superficial skin lesions in the scapular regions. The final diagnosis is based on the histopathological findings in the majority of cases. 1. Ozel SK, Kazez A, Koseogullari AA, Akpolat N. Scapular bronchogenic cysts in children: case report and review of the literature. Pediatr Surg Int 2005 Oct;21(10):843-845. 2. Rodgers BM, Harman PK, Johnson AM. Bronchopulmonary foregut malformations. The spectrum of anomalies. Ann Surg 1986 May;203(5):517-524. 3. Nobuhara KK, Gorski YC, La Quaglia MP, Shamberger RC. Bronchogenic cysts and esophageal duplications: common origins and treatment. J Pediatr Surg 1997 Oct;32(10):1408-1413. 4. Fraga S, Helwig EB, Rosen SH. Bronchogenic cysts in the skin and subcutaneous tissue. Am J Clin Pathol 1971 Aug;56(2):230-238. 5. Das K, Jackson PB, D’Cruz AJ. Periscapular bronchogenic cyst. Indian J Pediatr 2003 Feb;70(2):181-182. 6. 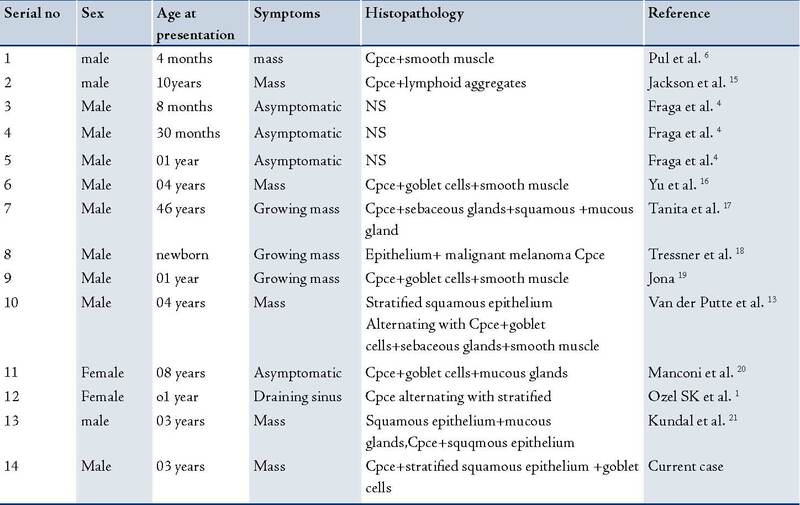 Pul N, Pul M. Bronchogenic cyst of the scapular area in an infant: case report and review of the literature. J Am Acad Dermatol 1994 Jul;31(1):120-122. 7. Sanli A, Onen A, Ceylan E, Yilmaz E, Silistreli E, Açikel U. A case of a bronchogenic cyst in a rare location. Ann Thorac Surg 2004 Mar;77(3):1093-1094. 8. Rodgers BM, Harman PK, Johnson AM. Bronchopulmonary foregut malformations. The spectrum of anomalies. Ann Surg 1986 May;203(5):517-524. 9. Nobuhara KK, Gorski YC, La Quaglia MP, Shamberger RC. Bronchogenic cysts and esophageal duplications: common origins and treatment. J Pediatr Surg 1997 Oct;32(10):1408-1413. 10. Fraga S, Helwig EB, Rosen SH. Bronchogenic cysts in the skin and subcutaneous tissue. Am J Clin Pathol 1971 Aug;56(2):230-238. 11. Schouten van der Velden AP, Severijnen RS, Wobbes T. A bronchogenic cyst under the scapula with a fistula on the back. Pediatr Surg Int 2006 Oct;22(10):857-860. 12. Zvulunov A, Amichai B, Grunwald MH, Avinoach I, Halevy S. Cutaneous bronchogenic cyst: delineation of a poorly recognized lesion. Pediatr Dermatol 1998 Jul-Aug;15(4):277-281. 13. van der Putte SC, Toonstra J. Cutaneous ‘bronchogenic’ cyst. J Cutan Pathol 1985 Oct;12(5):404-409. 14. Muramatsu T, Shirai T, Sakamoto K. Cutaneous bronchogenic syst. Int J Dermatol 1990;2:143-144 . 15. Miller OF III, Tyler W. Cutaneous bronchogenic cyst with papilloma and sinus presentation. J Am Acad Dermatol 1984 Aug;11(2 Pt 2):367-371. 16. Yu HJ, Kwon HM, Park JW, Hwang DK, Ahn DK, Park YW. A case of cutaneous bronchogenic cyst over the left scapula. J Dermatol 2001 Oct;28(10):572-575. 17. Tanita M, Kikuchi-Numagami K, Ogoshi K, Suzuki T, Tabata N, Kudoh K, et al. Malignant melanoma arising from cutaneous bronchogenic cyst of the scapular area. J Am Acad Dermatol 2002 Feb;46(2)(Suppl Case Reports):S19-S21. 18. Tresser NJ, Dahms B, Berner JJ. Cutaneous bronchogenic cyst of the back: a case report and review of the literature. Pediatr Pathol 1994 Mar-Apr;14(2):207-212. 19. Jona JZ. Extramediastinal bronchogenic cysts in children. Pediatr Dermatol 1995 Dec;12(4):304-306. 20. Manconi R, Bolla G, Pavon I. Congenital bronchogenic subcutaneous cyst of the back. A case report and review of the literature. Pediatr Med Chir 2003 Sep-Oct;25(5):364-366. 21. Kundal AK, Zargar NU, Krishna A. Scapular bronchogenic cyst. J Indian Assoc Pediatr Surg 2008 Oct;13(4):147-148.